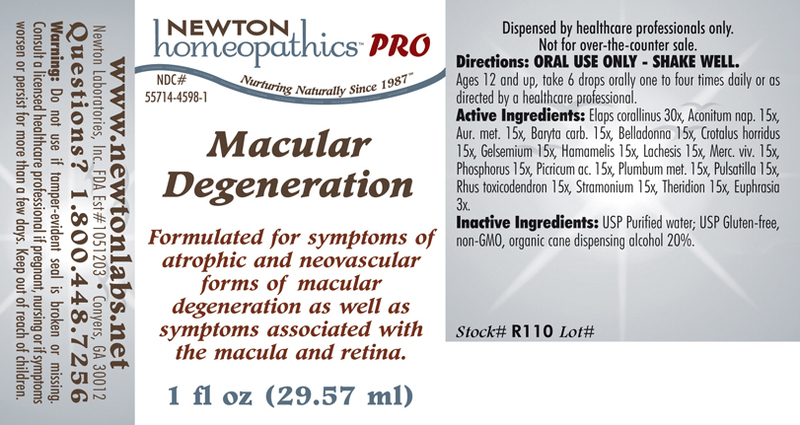 Macular Degeneration Formulated for symptoms of atrophic and neovascular forms of macular degeneration as well as symptoms associated with the macula and retina. Elaps corallinus 30x, Aconitum nap. 15x, Aur. met. 15x, Baryta carb. 15x, Belladonna 15x, Crotalus horridus 15x, Gelsemium 15x, Hamamelis 15x, Lachesis 15x, Merc. viv. 15x, Phosphorus 15x, Picricum ac. 15x, Plumbum met. 15x, Pulsatilla 15x, Rhus toxicodendron 15x, Stramonium 15x, Theridion 15x, Euphrasia 3x. Formulated for symptoms of atrophic and neovascular forms of macular degeneration as well as symptoms associated with the macula and retina.